Well, Well we are in the last week of August already. I can't believe that summer is on it's last legs so to speak. I am really hoping to get a long warm autumn. That would be so nice , to have the leaves stay on the trees and have all the warm fall colors embrace the harvest time. I have been busy coloring a lot of the new great images by the fabulous designers at Whimsy stamps the last couple days. They are some beautiful digital images. Sunday is September 1 already so you know what that means Whimsy's blog hop will take place, I hope to see you stop by again on Sunday and check out the great card designers by the Digital stamp team using the new September images from Whimsy Stamps. 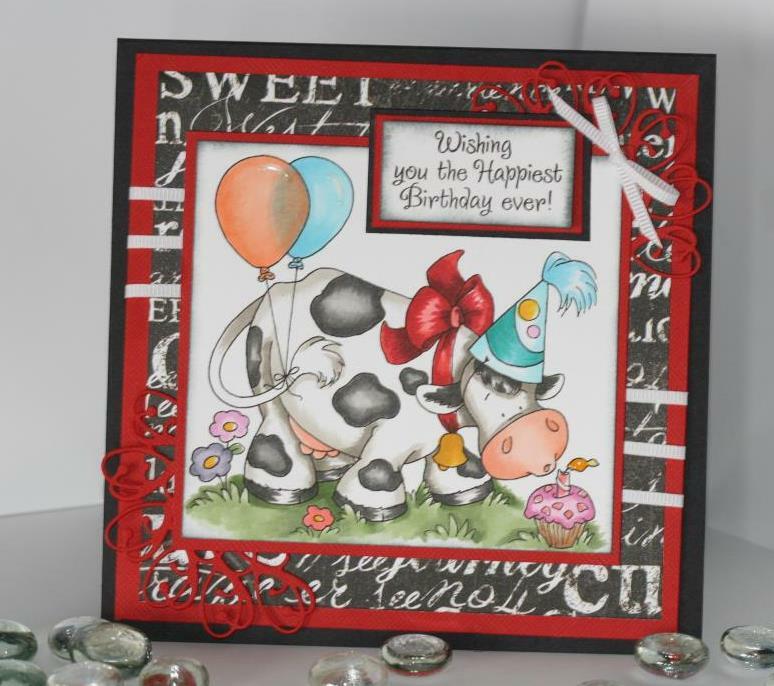 This is my card for this weeks post I'm hoping that it inspires you to be creative.This image can be found at Whimsy Stamps and is created by crissy's digi's. 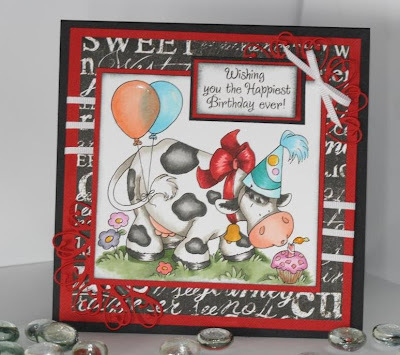 It's called Birthday Cow, a super cute image to work with. I hope you enjoy and hope to see you back on Sunday Sept 1. A closer look at the colored image, I also made an attempt to make the balloons look see through. It turned out pretty good being my first attempt and all. Supplies: Copic markers, Bazzill cardstock, Stampendous sentiment stamps Memory Box Die cut Quinn Flourish, Offray ribbon. OMGosh that is so cute! Great job, nice balloons! Colors are awesome, and that cow, very cute image..It has WOW factor written all over it! WOWOWOWOWOW!